Comet ISON barreled past Mars last week on its way toward a close encounter with the sun that has had scientists and skywatchers buzzing for a year. Comet ISON flew by Mars on Tuesday (Oct. 1), then gear up for a close solar approach that will bring the icy wanderer within 724,000 miles (1.16 million kilometers) of the sun's surface on Nov. 28. If ISON manages to stay in one piece, it could put on a memorable sky show around that time, experts say. 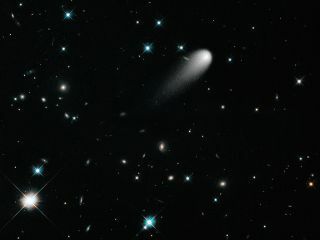 Comet ISON was tagged as a "comet of the century" candidate almost immediately after its discovery in September 2012, with some forecasts suggesting it could shine as brightly as the full moon in late November and early December. A spectacular show is certainly possible, experts say. But Comet ISON probably won't live up to the most breathless hype. "More likely, ISON will be one of the brightest comets in the past several years and, thanks to the global astronomy community, we hope one of the most broadly observed comets in history!" researchers with the NASA-organized Comet ISON Observation Campaign (CIOC) wrote in a recent status update. Based on how much dust Comet ISON is shedding, its core is likely between 0.12 miles and 1.2 miles across (0.2 to 2 km), CIOC team members say. Other estimates have placed ISON's nucleus somewhere in the neighborhood of 3 miles (5 km). So ISON appears to be an average-size comet, or perhaps a bit smaller than average. It's certainly a far cry from giant icy wanderers like the 19-mile-wide (30 km) Comet Hale-Bopp, which lit up Earth's night skies during its pass by the sun in 1997. Most sungrazers pop onto scientists' radar for the first time just hours before their solar encounters, but ISON will let them track a comet's evolution over a much longer period of time. Further, ISON is the first "dynamically new" sungrazer — one that's making its first trip through the inner solar system — in at least 200 years, CIOC team members say. To take advantage of this opportunity, CIOC is coordinating a global observation campaign that employs a variety of assets both on and off Earth. For example, NASA's iconic Hubble Space Telescope has joined the effort, as have sun-watching spacecraft such as NASA's Solar Dynamics Observatory and the agency's twin Stereo probes, as well as the Solar and Heliophysics Observatory, which is operated jointly by NASA and the European Space Agency (ESA). More farflung spacecraft spacecraft are participating as well, such as NASA's Messenger probe around Mercury and a variety of Mars spacecraft (more on that below). Earthlings have nothing to fear from Comet ISON, no matter how it behaves as it approaches the sun. ISON will miss Earth by 40 million miles (64 million km) during its swing through the inner solar system. And so will its bits and pieces, if the sun's gravity happens to tear the comet apart along the way. "During a breakup, comet fragments don't fly off in different directions like shards in a cinematic explosion," explains a new Comet ISON video released by the operators of the Hubble Space Telescope. "They break off but continue to travel along the path of their parent body. So any pieces would remain far from us, millions of kilometers away." Nobody knows exactly how bright Comet ISON will get. But assuming that it doesn't fizzle out badly, the comet may become visible to backyard skywatchers through binoculars by late October, CIOC team members say. Provided ISON survives its solar close shave — and there's certainly no guarantee that it will — the comet may then be visible to the naked eye sometime in early December, in the western sky just after sunset. Observers in the Northern Hemisphere will have a much better view of ISON than folks in the South, CIOC officials say.